Every house owner and hobby gardener knows the problem – where do you store all of the utensils you need for gardening? Potting soil, wheelbarrow, shovel, lawn mower and more are necessary utensils for maintaining your garden but they are not pretty to look at. Just having them stand or lie around the garden is not only dangerous but also subjects them to the weather. Keeping them in the garage or the basement blocks those for other uses. So what better way to “hide” them in a stylish way than with a storage shed made in Italy? Storage sheds are practical, keep everything tidy and don’t need a building permit. However, many garden storage units are made from plastic which clashes with the natural surroundings of the garden and moreover with the classy and extravagant furniture of the indoor and the outdoor living areas. Unopiù offers modern small garden sheds made from wood which have a naturally stylish design and seamlessly blend in with the luxurious design of the garden. Wood is a natural product which makes the garden shed automatically fit in with its green surroundings and the other garden furniture. It has a natural warmth to it that gives the wooden garden shed an organic feeling. The summer house sheds are available as attached or as freestanding variants and come complete with floor panelling. Our garden sheds protect the utensils stored here from weather or theft while at the same time being a high-quality design object instead of a disruptive factor in the outdoor area. 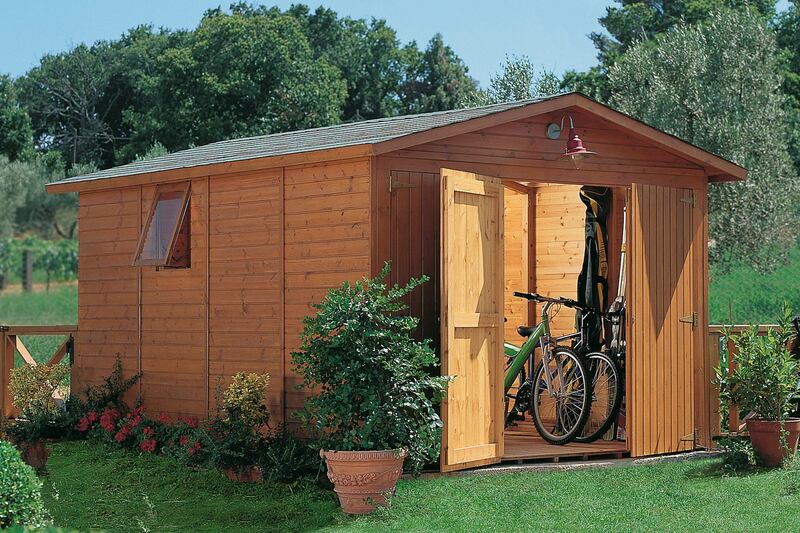 Thanks to its structure made from treated Nordic pine, the garden shed is very sturdy, weatherproof and long-lasting. A small wooden garden shed gives the garden a rustic and natural touch and matches every furniture style from classic to lounge or modern. The shed ist available in different colours or can be painted with colours from the Unopiù Colour range. It can also be enhanced with additional door and window panels.